Hey everybody! You’re probably all thinking… “What gives? 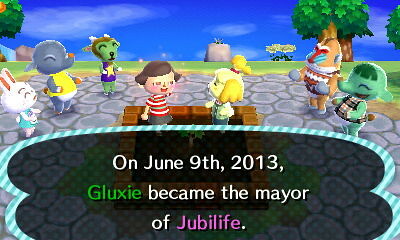 Why hasn’t Glux been posting blogs about her new Animal Crossing New Leaf town, Jubilife?” Well said, you. That’s a good question. The honest answer is that I really don’t have much time to blog these days. What I am able to do is post photos as things happen in Jubilife onto my Tumblr Blog (gluxbox.tumblr.com) which bounces the photos here onto the Glux Blog. I know it’s not the same, and I’m sorry for that. But ever since I came back from vacation, things have been crazy busy. Also I came down with a nasty chest cold that will not go away, so it’s been a struggle for me to get anything done. I’m going to try to do a quick recap of what’s been going on in Jubilife. Please follow me on Flickr and Tumblr to get the full experience. Jubilife started on June 9, 2013. I was ready to take on the challenge! 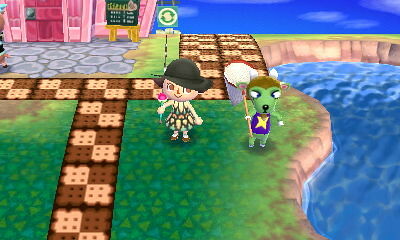 As soon as I was able, I commuted to Wasabi, where I ransacked the town, stole money and snagged designer fashions to wear. 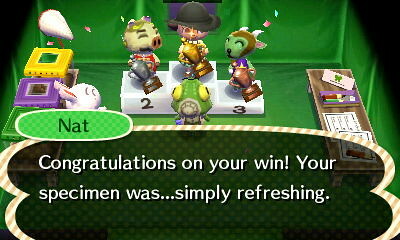 I’m finally able to enjoy the StreetPass functions in ACNL! 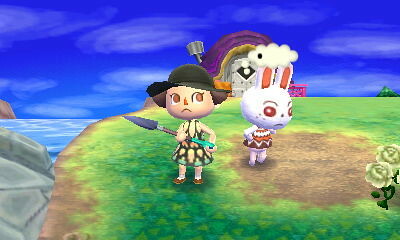 Here I am standing outside of Mayor Neko’s house in the Happy Home Showcase. 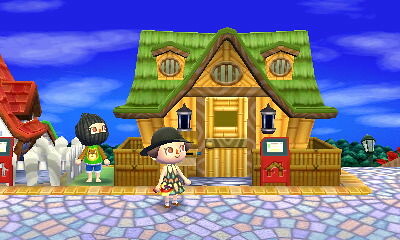 Also pictured… some type of robber who is scoping out Mayor Neko’s house. Hope she locked the door…! 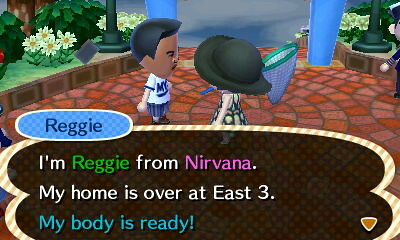 While I was at E3, I was able to get a special StreetPass from Reggie Fils-Aime! His house is weird. 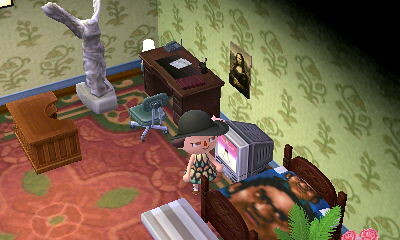 Reggie has a picture of his own face on his bed? Like I said… weird. 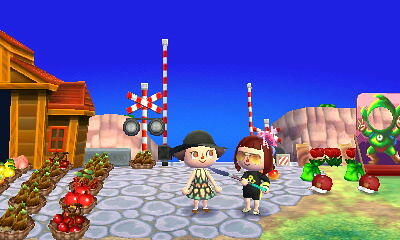 While I was in California, I had a visit with Mayor Yumi in Kasen Village. 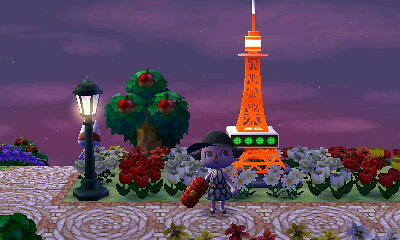 She has a Tokyo Tower there now! **ooooh! 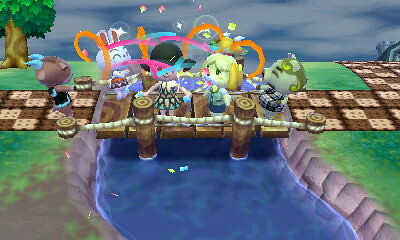 ** Also note that Mayor Yumi was kind enough to give me a squeaky hammer!! Been adding lots of public works already. I started with this suspension bridge, but have since added the Dream Suite and the Museum Renovation on Main Street. 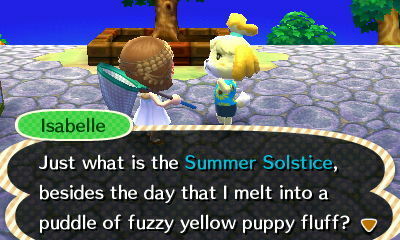 We had the Summer Solstice Festival on 6/21. It was really freaky – at night the sun was still blazing! Fireflies were floating about in full daylight. It was odd. We are impatiently awaiting the grand opening of Club LOL, which I expect to happen tomorrow. I haven’t decided which public work to start next. A third bridge? Gruff wanted me to add a Danger Sign… So many choices! OK I promise I’ll try harder to make time to blog about Jubilife. But the Tumblr updates should at least make it a little easier to keep you updated! Don’t even ask about Wasabi. It’s falling into disarray, weeds everywhere, bamboo starting to get overgrown… King better not move away, that’s all I can say! In other news, I also recently picked up the Wii U game “Game & Wario” which is REALLY cool! It makes great use of the Wii U Game Pad, with every mini-game using the GamePad in a different way. You can shoot arrows, draw shapes, complete puzzles, drive a taxi, dance like a pirate (don’t ask!) and lots more! There’s also a pictionary-esque side game that posts directly to the Miiverse, which is pretty cool. 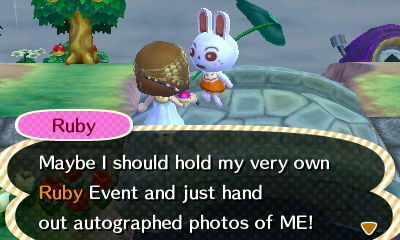 Here’s some of my screenshots from my Miiverse Profile! This is from the Miiverse Drawing game. It’s kinda like the app “Draw Something” but more Nintendo-themed. This is a screenshot from the cinematic at the beginning of the Ski game. The Ski game plays exactly the same as the F-Zero game in Nintendo Land, in that you have to hold the GamePad vertically and turn the GamePad to steer. It’s tricky! My score after playing the “Pirates” rhythm game. My score is… MEH! !